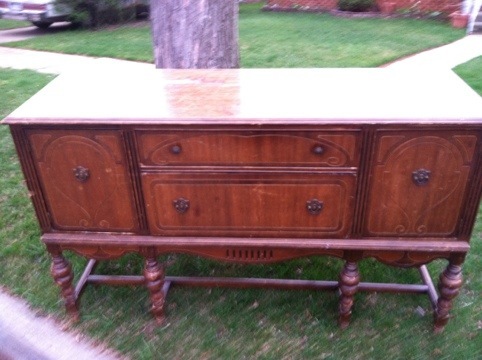 After dropping my daughter off at school yesterday — on Garbage Day — I spotted an awesome sideboard on the curb next to a pile of trash. Rrrrrt (sound of brakes being hit!) I pulled over to inspect it and found only minor problems, a bent hinge, water marks on the top, and one dent. It was clean and had been well cared for. Now to get it into the van! It was heavy but I was able to lift one end up and then slide it! Now it is mine! My apologies to everyone at work who had to look at the photo and hear the story over and over. As I have mentioned before, I love Garbage Day. Freebees like this are rare and I can’t wait to get to work on it.